Primary school student Keita Amano's curiosity is as innocent as any other child's his age. But when one day he decides to venture deeper into the forest, he encounters a small and mysterious capsule. Out from its depths comes Whisper. After 190 years of imprisonment, this ghost-like creature is glad that someone has been kind enough to set him free. He decides to reward Keita by becoming his guardian against supernatural forces. 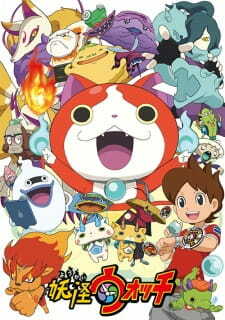 Whisper is one of many Youkai that exist in the world, and provides Keita with a special Youkai Watch, which enables him to see and interact with all the other Youkai. Youkai Watch was awarded the Best Film Award for a TV Series at the Tokyo Anime Award Festival in 2015. It also won the grand prize for Digital Content of the Year in 2014 at Japan’s 20th annual Association of Media in Digital Awards. Side story: Youkai Watch Movie 1: Tanjou no Himitsu da Nyan!, Youkai Watch Movie 2: Enma Daiou to Itsutsu no Monogatari da Nyan!, Youkai Watch Movie 3: Soratobu Kujira to Double Sekai no Daibouken da Nyan! In the slushy sea of content aimed at an audience of elementary schoolers, it can be difficult to fish up something that is actually genuinely enjoyable. There's a lot of fluff titles, a lot of preachy titles, and a lot of titles that are just dorky action. Nothing is actually wrong with being any of those things but such traits don't mark a show as noticeable in a sea of content. Especially with the competitive nature of appealing to such a young age group with a low attention span. Among this lot, Yo-Kai Watch has become another one of those successful accounts that has grabbed the attention of kids and adults alike. Yo-Kai Watch (NOT 'Youkai' Watch, I'm not sure why its listed as that here) has similar origins to Pokemon in that respect: a video game about catching creatures that became a hit and started producing more games and ultimately a popular anime. One could argue that this is less because of the quality of the show and more due to the popularity of the games boosting success. And while it is likely that the games helped in the success of the show, I do think its more than just that. After all, being an adaptation can only help so much: at some point these shows must stand on their own two feet and prove they can perform. So....can Yo-Kai Watch? The short answer is yes, it can. I actually saw the anime before I even knew there was a game so I can assure you that it can. This anime has a lot of things going in its favor. While it has a fairly boring setting fueled by something of a gimmick (yokai exist and cause trouble with their unique powers), it is held up by multiple factors. Probably the strongest among these is the characters. The personalities present in this show are very one note, but the show is also very aware that the personalities are one note and often use that to their advantage. It knows when to expand on them and when to keep them as they are. Even one of the running gags is that the protagonist is an archetype of a protagonist and therefore inherently a 'boring guy', which he protests. Speaking of, there are three characters who appear in almost every episode (up until Inaho is introduced as an alternative): Nate (Keita), Jibanyan, and Whisper (Whissu). They're set up in a 'boke and tsukkomi' type of comedy rountine: Nate is typically our straight man with Jibanyan and Whisper being our wise guys, though the roles do get shuffled about occasionally. They're over the top, likable, funny, and even sympathetic at times. Later introduced is the erratic and more over the top Inaho, matched up with the more straight man character USApyon, to completely flip the formula. Both sides work really well. As far as art goes, for a show geared at kids, the animation in Yo-Kai Watch is typically surprisingly high quality. At a later point the show would go on to make its first movie and the quality of the animation did not even really have to be bumped up that much, because the show as a whole already had really good animation. The designs are all from the game and they're all represented really well, and move really smoothly. The style is a SLIGHTLY modified version of the game art, with the eyes occasionally being a little bigger than the original game style and the faces being a little rounder as well. They're both cute styles to look at. Art and characters aside...this show, unlike its predecessors in the popular 'kids with pets' genre of the past, focuses less on action and waaaay more on comedy. It's hard to judge the plot because functionally speaking there really isn't one. It's more of an monster of the day gig with each episode focusing on a unique yokai and the trouble they cause. Nate and his friends, being responsible for the Yo-Kai Watch, are inadvertently tasked with solving the yokai's problem so they'll stop causing trouble for people. The yokai typically have abilities that cause inconveniences to people like making people unable to stop crying, desperate to go to the bathroom, or unjustly aggressive and 'punklike'. Some of the humor can go into the realm of toilet humor, so be warned. As a whole, though, it tends to have plenty of pretty snappy character based comedy in that mix as well. A final note to contemplate here is the music and dub quality. When I say quality, I do mean it. Yo-Kai Watch's dub was done by Dentsu Entertainment USA in cooperation with the Disney Channel, and they put a lot of effort into making the dub sound pretty damn good. They went ahead and also made an English dub for the opening as well, which is contagiously catchy to the point that I'm not really sure why they changed it later on. The regular music is a mix of pieces ripped seemingly directly from the game, though there were some odd musical pieces that I could swear were from Phoenix Wright. Overall its well made, likable, and if you want to indulge your inner child then its definitely the show for you. Obviously a good amount of the show is meant to sell merchandise and increase game sales, but effort was clearly put into it despite that. I managed to watch 50 episodes in about a week! People on the internet will tell you that this tries too hard to be the next Pokémon. But that's not true at all, this show doesn't want to be anything like Pokémon. Youkai Watch tends to be more of a comedy series with various skits than an anime about a teenage boy going on an adventure. Don't expect much of story, but the anime has a lot of charm to it. This anime is very self-aware and most of the jokes and skits are actually really funny. Some jokes tend to get old after a lot of episodes, but they always find a way to keep the show refreshing, even after 50 episodes. You can clearly see that the creators have a lot of fun making this anime. The Youkai Watch anime now lacks an English subbing group for it. This is a shame as the anime is funny to watch and is currently one of the top ten children anime in Japan's Kanto region. I hope this review may be able to help change things as clearly a number of people (including myself) enjoy it. I plan to watch on and probably pick up the Japanese language at the same time, even if it will take ages for a group to pick this up again. Youkai is a term for Japanese spirits, ghosts and monsters. A "Youki-pedia" series, this anime depend a lot on slapstick jokes and unexpected twists for humour/entertainment. Elements of the show may be paralleled with Pokemon, except that one does not catch Youkai, one befriends them. The protagonist, Keita, unwittingly frees Whisper (a ghost Youkai) through inserting a coin into a gashapon machine. Whisper decides to follow and help him out of gratitude and gives Keita a Youkai watch to see other Youkai. They get into various Youkai-exploring adventures and collect Youkai friendship medals along the way. Although children will enjoy this series the most, there will be people of other ages who will be able to appreciate its light-hearted nature. As of Episode 4, this show's story uses a few fixed formulas (typical to child-friendly anime) that vary slightly each episode. 1) Gaining medals from a friendly youkai who drops by to say hi. 2) Introduction to a friendly youkai who may have problems of their own and/or cause problems for real people. 3) Solving of the youkai's problems sometimes, but not always. 4) Introduction to backstory of the youkai's past lives before becoming a youkai. 5) Youkai battle, usually against a troublemaking or scary youkai that engages in battle with a summoned friendly youkai. 6) Youkais-of-the-week: Recap of the medals that Keita obtained (Usually 2-3 of them). 7) A special portion where a Youkai featured gets into all sorts of funny situations. The music is typical for a normal anime series. The summoning sequence is thankfully not boring to watch as there will be eight (excluding one special) different kinds depending on the youkai medal type. Characters have their own special characteristics which create for dramatic and humorous effects in the show. Overall, this anime is not amazing, but it will be entertaining to watch if you are interested in Youkai or supernatural things, want something light-hearted/funny to watch and can find your inner child to watch such an anime. Youkai Watch. It's an anime you may have heard of, a lot of people compare it to Pokémon partially due to it's growing popularity in Japan overshadowing Pokémon's. However, this anime is not actually as similar to Pokémon as it seems. Both series center around a boy in a world filled with monsters, but the main difference is that their stories and interactions are presented completely differently. They both function as kids 'monster of the week' series but Pokémon is filled with epic battles and plots about evil teams wanting to take over the regions. In contrast, Youkai Watch is a pure humor anime consisting of multiple skits per episode with no real plot or purpose. That is not to say Youkai Watch is good or bad, but if you're expecting an epic quest or any overall plot, you'll most likely be disappointed. The series is about Keita's daily life and interactions with youkai, plain and simple. Occasionally there will be plot but it's few and far between. The anime tends to follow the same structure as the episodes go by, but the series manages to keep most of the jokes refreshing. Some jokes can grow stale but it stays entertaining for the most part. The humor is mainly self-aware, it's a series that is aware that the premise and characters can get ridiculous and embraces it. As such, the jokes can rely on slapstick humor and ridiculous circumstances. For me, the humor rarely fell flat though that will possibly not be the case for you. Still, if you're looking for such a light-hearted humor anime, this may be an anime worth considering. Another difference between Youkai Watch and Pokémon: Keita, the protagonist, is completely normal. In fact, the only truly unique thing about him is the fact that he can see and interact with youkai. He's constantly referred to as 'normal' and 'average' by his classmates, which I find to be a nice touch to the anime. Keita is more relatable to most children than most protagonists who have something special, a power or being the Chosen One. He's simply an ordinary boy who stumbled upon a gachapon machine by accident. Even these youkai don't help him out that much- for the most part they just cause him trouble. His 'butler' Whisper is incompetent and knows little about youkai and the series' mascot, Jibanyan, rarely ever wins fights he's summoned to. So really, even his special skill serves to hinder him more than it helps. He is also not a boy made entirely of moral fortitude and a will to do the right thing like many other kids anime. He can be troublesome and naughty at time, but he can also have many moments of wanting to do the right thing. Again, it serves to make Keita represent an actual child more, which is a nice change from the generic protagonist. In fact, character is one of Youkai Watch's strong points. Although there tends to be little character development due to it's lack of plot, the characters are full of charm and each character is unique. Each youkai has has their own distinct personalities and abilities which helps prevent the repetitive format from growing stale. The art and sound are average, typical for most kids anime. It's not amazing but it still has it's own charm. Overall, I think the series is worth picking up if you're looking for a lighthearted humor anime, or are fond of anime featuring numerous different monsters. Just don't expect any real plot and you'll be fine.